I'd be hard-pressed to ever have to choose my favorite city in Europe, but Brugge, Belgium, would be at the very, very, very near top of my list. 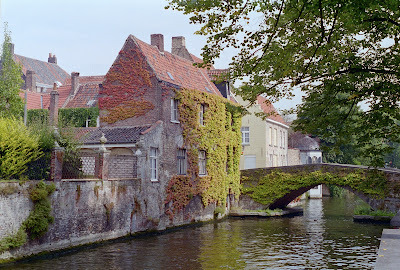 I visited Brugge after college (ahem, kind of a long time ago). Will definitely get there again while we are living in Switzerland. Pretty photo with the ivy. Brugge is definitely a beautiful city. Great photo. Can we put this on the top of the list of places that you and I can visit together someday? I LOVED Brugge though I only spent about a day and a half there. I know you sleep later than me, but I'll be happy to go out, take a walk along those beautiful bridges and have a truly authentic (and OH SO delicious!) Belgium waffle til you wake up. Aren't bridges great when you're travelling with kids? My daughter loves them. At the top of my list, too! I've only ever been at the peak of winter, around Christmastime, and it was just as pretty covered in a veil of snow. I'd love to go back in the springtime! Your blog looks fun I look forward to reading more. Gorgeous! My parents are heading to Belgium next week on a riverboat cruise and they plan to stop in Brugge. So jealous, I've never been.